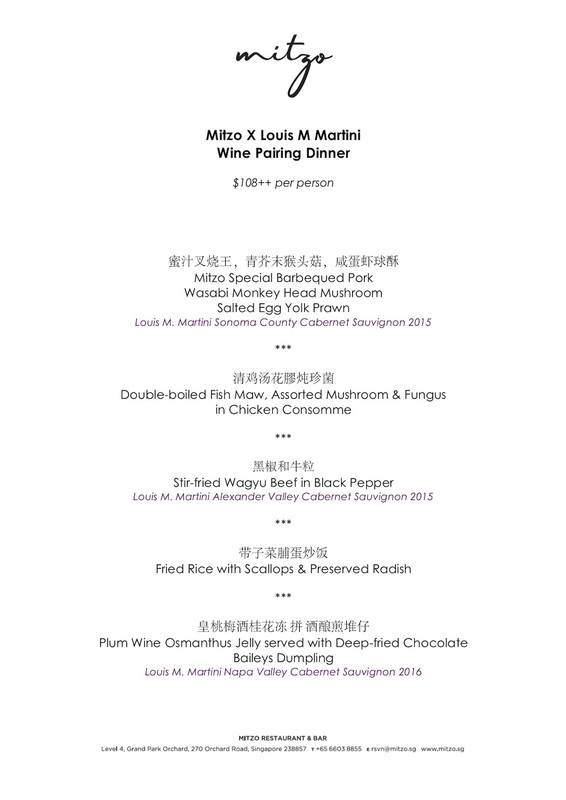 Modern contemporary Chinese restaurant Mitzo at Grand Park Orchard will be hosting a Louis M. Martini wine dinner on Friday 29 March 2019 at 7pm featuring a range of wines from the iconic Napa Valley winemaker. E&J Gallo-owned Louis M. Martini is a Napa Valley winery that has crafted world-class Cabernet Sauvignon since 1933. Pioneering founder Louis M. Martini played an integral role in establishing Napa Valley as one of the world’s premier wine-growing regions. Today, the winery continues to make a range of celebrated Cabernet Sauvignon wines from Napa and Sonoma. For this exclusive one night wine pairing dinner, Mitzo will be hosting Aubrey Buckingham, the Fine Wine Ambassador of E&J Gallo Winery – the world’s largest family-owned winery -who will regale diners about the wines produced from this esteemed winery. The full food and wine pairing menu is given below. This Louis M. Martini wine dinner costs $108++ per person. To secure your seat, email CK at chunkiat.ng@parkhotelgroup.com.